Platelet Rich Plasma Therapy has been widely used in the Sports World by world-class athletes as an innovative treatment to hasten the healing of injuries, especially in joints, tendons, ligaments, and impingement syndrome in your shoulder, back pain, knee pain, and other conditions. PRP is a therapy that utilizes a patient’s own blood platelets that are injected to the point of injury and successfully bring about accelerated healing. There are very few doctors in New York in this innovative treatment. We are proud that our own Dr. Daniel Khaimov is in a small select group of doctors trained and using these treatments in the region. 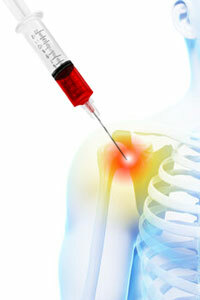 Please contact us today to learn more about PRP and whether this is an option for your pain condition. The normal healing process, when a body part is injured, involves the response of increased blood flow with the delivery of activated platelets to the site of injury. The release of these platelets, that are full of growth and healing factors, is key in stimulating the acceleration of the healing process. There are times after an injury when healing is extremely slow or never occurs at all. By delivering high concentrations of platelets, the exciting treatment option, PRP, intensifies your body’s normal healing abilities. How, precisely, are Protein Rich Platelets created? With the use of a treatment syringe, a patient provides a blood sample of concentrated platelets that is then separated into 2 parts – red blood cells and white blood cells. To “jump-start the body’s healing process, this concentration of platelets is injected through the assistance of ultrasound imaging into the specific area that is injured. This treatment open speeds strength and healing to the injured point of the body. This procedure is performed by Dr, Daniel Khaimov as an outpatient procedure, and it typically takes about 45 minutes. Because there is no use of general anesthesia, no risk of surgery, and no hospital stay, most patients are able to return to work that same day. In addition to the accelerated effective healing, this in-office procedure is a mere fraction of the expense of having it done at a surgical facility.